Nice example of a fairly early Pillar Dollar. It is said that the Dollar symbol ($) derives from the banner entwined around the pillars, which themselves represent the gates to the 'New World' as you exit the Mediteranean Sea through the Pillars of Hercules. These were the first truly and purposly round coins to be milled in the 'New World', the previous 'cobs' where hand struck. Don Bailey says of these:"On March 29, 1732, the striking of round coins began. 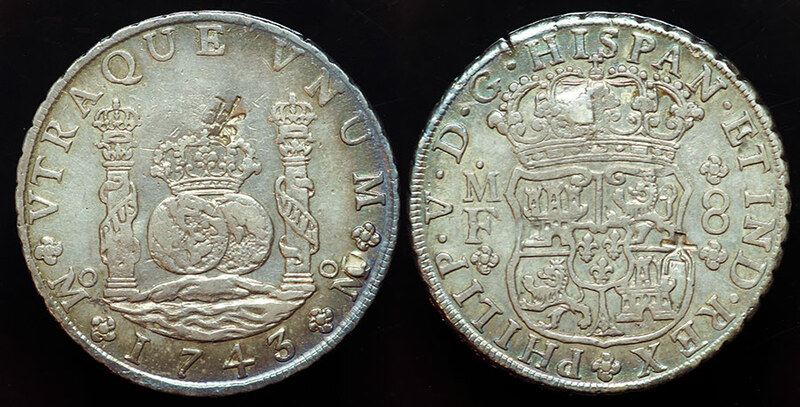 On this date, five silver coins and four gold coins were struck: half, 1, 2, 4 and 8 reales in silver, and 1, 2, 4, and 8 escudos in gold. The design of the milled coinage, which in numismatic terms means produced on a screw press as opposed to the previous method of hand striking the dies with a heavy hammer, was changed to what is most commonly called Pillar. Some refer to the design as World, Globe, or Two Worlds type. The obverse of the Pillar coinage shows two hemispheres surmounted by a crown between the crowned Pillars of Hercules. These rest upon a wavy semicircular base, symbolic of the ocean separating the two continents. The inscription around VTRAQUE VNUM ("both worlds are one") with date below and the M Mint mark at each side of the date. On the obverse is the coat-of-arms similar to the one on the coinage issued under Charles and Johanna, the arms of the Kingdoms of Castile, Leon and Granada with the Bourbon escutcheon added. The inscription around reads PHILIP. V.D.G. HISPAN. ET IND. REX. The assayers' initials to the left of the coat of arms with rosettes above and below, and to the right the value in Arabic numerals between rosettes. The edge design is a unique floral pattern known as the tulip edge. The Pillar design coin with denomination of 8 reales was also known as the romantic "piece of eight" and was legal tender in the United States until 1857. This is the type of coin that George Washington supposedly threw across the Potomac River." There's a couple of Chinese chops, not too obvious, to prove its value in the Orient. Here's a real World traveler. Philip V of Mexico. See the link in "Comments" below for a complete review of Spanish Colonial coins of Mexico in the Moneta Library. To read more about ancient money of the Americas see the article in the Moneta Library by Don Bailey on 'Spanish Colonial Mexico' below.